If paracord does not seem like a useful survival and repair tool to you, chances are your knowledge of knots is lacking. STOP! Don't leave now just because you feel insulted or think knots are old-fashioned. The truth is: they are old-fashioned, and that's exactly why you need them. If you don't believe me, scroll down to the pictures near the bottom of this post. "A decent knowledge of knots could mean you making it all the way home with your new mattress still on the roof of your little Honda Civic instead of it landing on the busy freeway behind you." As simple as rope is, it's simplicity is somewhat deceptive. Rope is not a tool that comes ready-to-use. It's not like a hammer or wrench that has an obvious purpose. Rope is for more than just "tying things up" and then, even how you tie something up is not to be taken lightly. A decent knowledge of knots could mean you making it all the way home with your new mattress still on the roof of your little Honda Civic instead of it landing on the busy freeway behind you. Just as some of your parents or grandparents might be fairly computer illiterate, you may be somewhat knot illiterate. Thus rope is useless to you. You don’t know what rope can do for you, and you don't know how to tell it to do what you want it to do. Through this summer series, I hope to teach you some of the most useful knots that can help you in your daily life. If you are a sailor, survivalist, or even a fisherman, this is likely not the series for you. These are going to be simple tutorials for the everyday man or woman living in the modern world. We already have at least 4 posts lined up for this series that will come out monthly. This first one serves a an introduction. They following posts will each cover a specific class of knots, complete with instructions and examples of how they are useful, so stay tuned for more to come! If you are serious about knots, you might want to get your hands on a copy of The Ashley Book of Knots by Clifford W. Ashley. Due to the fact it was written in 1944, with the death of the author following shortly after in 1947, the original printing is now part of public domain. Unfortunately, most of the copies available online are a reprinting that still falls under copyright. There are other good resources available as well, such as Knots, Splices and Rope Work by A. Hyatt Verrill. For this first installment, I am going to familiarize you with some of the terminology used in the world of ropes and knotting. I will limit it to terms that will be useful to a beginner and will update it if we run into more technical jargon later on, so keep track of this article for reference. Standing End (1)—This is the end of your rope that is attached to something or is still rolled up. Either way, it's the end you are not using. Working End (2)—This is, quite simply, the end you are working with. If one end of your rope is already attached to something, the other end is your working end. Bight (3)—This is a middle section of rope, usually folded back on itself, creating a "U" shape. If a knot is described as being tied "in the bight" it means that you do not need access to either end of the rope to complete the knot. Elbow (5)—Whereas a loop is a rope crossing itself once, an elbow is one rope crossing itself, or another rope, twice. Once over and once under. An elbow can be formed by by making a loop and twisting it 180 degrees farther. Setting—This is the process of tightening a knot. For simple knots, this is a pulling of both ends. For more complicated knots, one may need to gradually tighten all parts of the knot in order to keep it from capsizing. Capsizing—When a rope is not tightened correctly, it may capsize or become deformed and not function properly. Can you think of any other basic terms that should be added to the list? Comment below! I will refrain from including names or kinds of knots in this introduction. The meaning of those will be more clear if they are accompanied by a demonstration or tutorial. I'm a firm believer in motivation before instruction, so perhaps before we move on, you need some convincing that knots have any place in your modern world. Below is a showcase of knots in use, gathered from around the internet and everyday life. Photo credits belong to their respective websites. If you don't understand what is going on in the picture, hover your mouse over the picture for an explanation. Convinced yet? Whether you consider yourself an outdoorsman or not, knots have uses in many areas of our daily lives. Come along for the journey as we learn the timeless skill of knot tying. Even if you are a frequent paracord or rope user, you may still gain some new skills from this series. 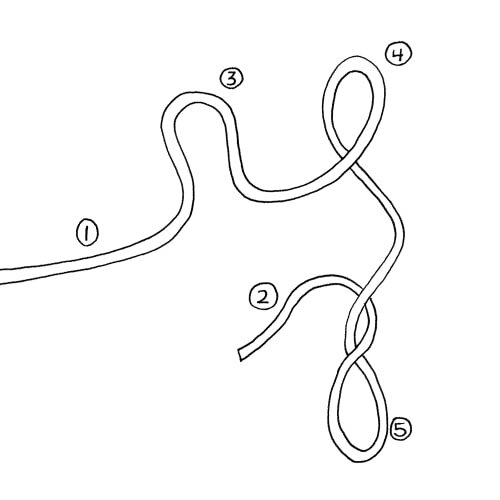 Next month we will cover the first of the four basic knot classifications: "loops." Also, if you want to learn any of the knots in the pictures above, let us know so that we can include them in future tutorials! For more inspiration, check out our Instagram!